I am late to the Walking Dead movement, so I made a pledge that I would catch up thought Netflix while riding my bike. Don’t worry it was a stationary bike. I was well into achieving my goal when I came across an episode where the crew was in a prison and in the beginning of the episode was of a picture like the one below. This really grabbed my attention, and thought it was a prefect symbol for so many things. 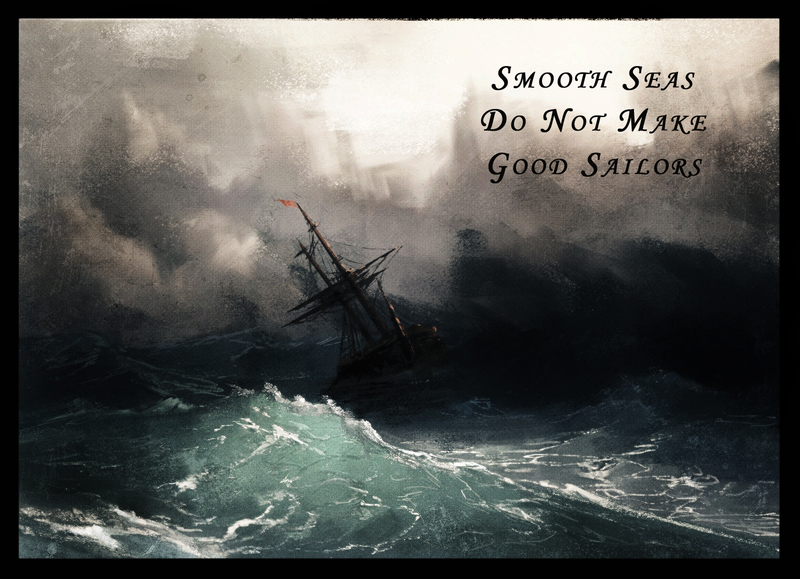 I have had the terrible fortune of being in difficult seas. My father-in-law was a commercial fisherman. I married one of his daughters so, in his mind, I was naturally “help”. I wanted to get to know him better so I took him up on an offer which I know now was a job interview to accompany him on one of his trips. He woke me up at 3am, which at that time I was 24 years old and didn’t know it was possible to wake up at 3am and we headed out to his boat. When we got there the combination or choppy seas, dead fish and diesel fumes put me in a position to long for dry land. I was trying to tolerate the conditions when I noticed that it was very dark. I looked at my watch and it said 8am. It should have been light. About that time the radio was going crazy and the coast guard was asking all boats of a certain rating, which we were one of them, to go back to port. My father-in-law told me we were too far out and the storm was coming on too fast so we were going to have to ride it out. I thought that was a terrible idea and tried to convince him to out run it (bad idea). You know… lighting is a funny thing. You are forewarned of it coming. I would imagine a lot like bombs during war, but it’s on you so fast you have no time to react. The only point that I was in fear of my life is when we finally got back to land and the other salty fishermen were shocked and amazed that we were out in that weather. I was fortunate to have been with someone who knew what he was doing. It’s true I wanted to tell that story so all of my readers can know what a colorful life I have had, but it makes a good point about smooth seas don’t make good sailors. If you think of it, the more experience a person has and the more difficult that experience, with systems, change, technology and people the better sailor or accountant they are. The point to this story when automating… trust your gut and if you don’t have any experience with automation… trust someone else gut that you trust.